Richard B. Hays, Dean of Duke Divinity School and George Washington Ivey professor of New Testament. Scott Jones, United Methodist Bishop of the Kansas Area. Wade Paschal, senior pastor of First United Methodist Church in Tulsa with 9000 members. Tom Albin, Dean of the Upper Room Chapel. Rebekah Miles, associate professor of ethics at Perkins School of Theology. L. Gregory Jones, vice president and vice provost for global strategy at Duke University and professor of theology at Duke Divinity School. Ben Witherington, Amos professor of New Testament for doctoral studies at Asbury Theological Seminary and author of over 40 books. Steve Rankin, chaplain at Southern Methodist University. Ted Campbell, past president of Garrett-Evangelical Seminary and present associate professor of Church History at Perkins School of Theology. Wendy J. Deichmann, president of United Theological Seminary. What do they all have in common? They have all been instrumental in the renewal of the United Methodist Church. They all possess a Ph.D. And all of their doctoral studies were made possible by annual grants from A Foundation for Theological Education (AFTE). Founded in 1977, AFTE is the creation of two regal figures within United Methodism who could hardly have been more different—Dr. Albert Outler, the erudite seminary professor who at the time was the world’s foremost authority on all things Wesleyan, and Dr. Ed Robb Jr., traveling evangelist and the day’s best known critic and reformer of the UM Church. Ironically, this oddest of couples discovered that they had much in common. They both loved the church, treasured our Wesleyan heritage, and were greatly concerned about the state of theological education within the denomination. And they both felt that true renewal would never be possible or lasting if UM pastors were not trained in the great tradition of classical Wesleyan theology. In the late 1970s, theological education within the United Methodist Church promoted old-school liberalism, process theology, and liberation theology in all its forms. About the only flavor missing from this Baskin-Robbins approach to theological education was orthodoxy—the classical teachings of the church proclaimed by the apostles and the early church fathers and accepted by believers all around the world for the past 2000 years. Many UM seminaries at the time had few if any true champions of classic Wesleyanism. And students often left the ivory towers of religious education confused about what to proclaim, ill-prepared for the pastorate, and out of touch with the needs and the beliefs of the church members they were to shepherd. Albert Outler and Ed Robb were vexed over the theological trends in the seminaries preparing United Methodist preachers and professors. They wanted something substantial and transformative that would provide long-term change. What they agreed upon was AFTE, a program designed to raise up a new generation of leaders. The basic motivation came from John Wesley. “The Wesleyan tradition affirms both sound learning and vital piety,” explains Dr. Steve G.W. Moore, the senior program scholar of AFTE. “The idea behind AFTE, which Albert Outler and Ed Robb had together, was that those two things had to be held together; one of the key contributing factors was preparing faculty members and leaders for the United Methodist Church who would hold those two together, who wouldn’t let theological education or higher learning be separated from the vital life of the church. The mainstay of the organization is the John Wesley Fellows program, dedicated to aiding United Methodists pursuing doctorates by annually awarding up to five fellowships worth $10,000 each. The total output of church resources from John Wesley Fellows is astonishing: in addition to teaching, preaching, and leading in a variety of capacities, an ever-expanding library of resources reflects the fruits of the investment AFTE makes in up-and-coming church leaders. For example, 21 scholarly contributors to the recent Wesley Study Bible were John Wesley Fellows—including the co-editor, Dr. Joel Green, Associate Dean for the Center for Advanced Theological Studies and Professor of New Testament Interpretation at Fuller Theological Seminary. Liberal seminary deans and presidents were skeptical at best when AFTE began its work. In fact, many were belligerent. One dean was quoted as saying that a John Wesley Fellow would become a member of his faculty only over his dead body. He has since passed on. Three of the Fellows are now professors at the seminary he once headed. Over time, the credentials and the work of the AFTE students simply could not be dismissed. With degrees from schools like Oxford, Cambridge, Yale, Harvard, Princeton, the University of Chicago, Edinburgh, and Aberdeen, their academic pedigrees were beyond question. Presently, John Wesley Fellows hold positions at eight UM seminaries: Candler School of Theology, Claremont School of Theology, The Theological School at Drew University, The Divinity School at Duke University, Garrett-Evangelical Theological Seminary, Perkins School of Theology, United Theological Seminary, and Wesley Theological Seminary. Outside official UM seminaries, they also serve as professors at Asbury Theological Seminary, Fuller Theological Seminary, the School of Theology at Seattle Pacific University, Luther Seminary, Princeton Theological Seminary, Seminario Evangelical Unido de Teologia, as well as numerous colleges and universities. These scholars can be found teaching Christian Education, Christian Ethics, Evangelism, Higher Education/Administration, History, New Testament, Old Testament, Philosophy of Religion, Sociology of Religion, Spiritual Formation, Theology, Wesley Studies, and Worship/Liturgics. Although John Wesley Senior Fellows—the alumni of the program—find classic Wesleyan theology in common, they represent culturally diverse viewpoints ranging from United Methodist renewal group partners to Sojourners leadership. Behind the scenes influence. The long-lasting impact that AFTE brings to the United Methodist Church isn’t limited to academic resources or seminary contexts. Surprisingly, the organization that quietly provides scholarships to so many noted pastors, scholars, and leaders has a relatively low profile. Rather, it is content to let its voice be heard through the endeavors of men and women such as Dr. Amy Laura Hall, Dr. Khiok-Khng Yeo, Dr. Priscilla Pope-Levison, Dr. Jerry Walls, Dr. Joy Moore, and Dr. Lester Ruth, to name just a few. Despite its low profile, AFTE has awarded over $2.5 million in grants since its inception in 1977. The organization does have a small endowment, but most of its resources dedicated to funding scholarships come from individual donors, many of whom have benefited from AFTE over the years. And it is this very camaraderie that draws students to AFTE in the first place. Theological fellowship. Every winter, current and former John Wesley Fellows gather for their popular Christmas Conference. Part alumni reunion, part theological colloquium, part networking opportunities, the Christmas Conference provides fellowship, training, and brainstorming. This year’s Christmas Conference included plenary addresses on subjects like “The Future of Theological Education” as well as papers presented by, and responded to by, current and Senior Fellows. In your mailbox. 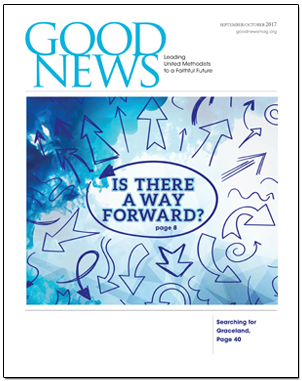 While AFTE may keep a relatively low profile, it should be familiar to seminary students: every United Methodist seminary student, regardless of the school they attend, receives a free subscription to Catalyst, AFTE’s quarterly publication dedicated to encouraging the academic and intellectual development of United Methodist students. Perhaps no other organization has influenced United Methodist theological training more than AFTE has in recent decades. The expected trickle-down of influence envisioned by Albert Outler and Ed Robb is now emerging all the clearer as students who were trained by the first John Wesley Fellows are now preparing mentees of their own. The AFTE family tree continues to grow new branches—and its fruit can be found in your own backyard. To inquire about becoming a John Wesley Fellow or to make a donation to AFTE, contact Mr. Paul Ervin, Executive Director, P.O. Box 238, Lake Junaluska, NC 28745 (paulervin@prodigy.net). Phone: 828-456-9901. Catalyst subscriptions are available to the public for $5 annually. For more information, visit www.johnwesleyfellows.org or www.catalystresources.org. Elizabeth Glass Turner is a freelance writer who has contributed to multiple online and print publications. She has an essay in the forthcoming “Sherlock Holmes and Philosophy.” Elizabeth currently resides in a multigenerational household with her husband and 11-month-old son.